Other privacy fence materials, such as wood and vinyl, may seem to cost less, but because they have a short shelf-life, they require major maintenance and periodically have to be replaced. StoneTree® Precast Concrete Fence Walls do not succumb to the rigors of the elements like other fence materials do, so they require less maintenance, and look beautiful for many generations to come. Privacy fence panels provide a greater level of seclusion and protection than standard fence systems. While fence wall height is a primary criteria for privacy screen fences, those who have precast concrete screen walls appreciate the related benefits. Precast concrete fencing provides not only physical solitude and isolation, but they provide safety from intruders, motor vehicles and reduce noise from the other side of the wall. When landscapers are looking for privacy fence ideas for their clients, and seek styles, designs and textures that complement the surrounding area. StoneTree® Privacy Fence panels Sections are vertically cast, to ensure there is a beautiful natural-looking stone, brick or block texture on BOTH sides of the wall, creating an attractive view from every angle. StoneTree® Privacy Fences can be manufactured and installed in heights up to 12 feet, with higher heights available on request. Each Combo-Cast™ Panel is 15 feet in length, and panels join together in such a way as to ensure prying eyes are discouraged from viewing the enclosed spaces. StoneTree® Fence Panels are a minimum of 5” thick. And since concrete is a dense material, it acts as a reflective sound wall noise barrier, minimizing the penetration of sound through the wall, maintaining privacy from both sides. Sometimes privacy isn’t enough, and an additional level of security is required. 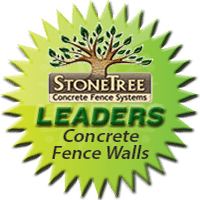 StoneTree® Privacy Fence panels easily integrate security fence equipment features such as cameras, fence lighting or razor wire, providing an additional measure of seclusion.